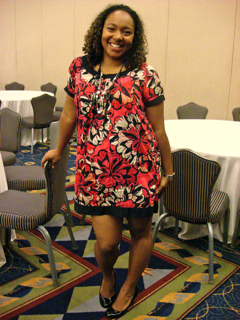 I had so much fun checking out other women at Type-A Mom, I had to do it again at Blogalicious. It was a great weekend: My writing workshop went well (read, nobody threw tomatoes), I made a bunch of new friends, and I got a chance to roam around South Beach (if you're ever there, David's Cafe Cuban Cuisine is fantastic). Once again, I missed the kids and Dave, but I wasn't away for that long this time and Dave kept them happy with pumpkin picking, Build-A-Bear, a haircut for Max (who now enjoys them) and countless French fries. 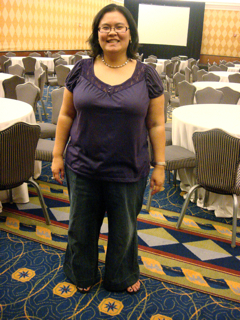 I love celebrating the variety of shapes and sizes at these conferences, glorious proof that there is no one "right" body type. See for yourself! 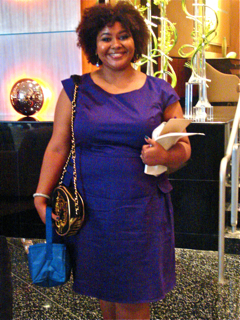 Kimberly C. Ellis, aka Dr. Goddess; how could I not put her first?! 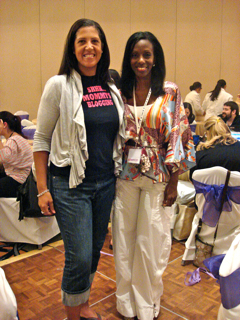 Left, LaShanda Henry from Sistasense and Onica Cupido from The Mommy Factor (thanks again for the tech tip, LaShanda)! And my adventures-in-sushi-and-gelato pals Deirdre from Savvypreneur and Toni from Wine With Toni, super-fun ladies who fly. 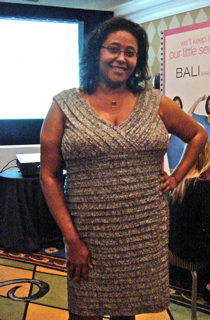 OK, so I'm considering getting into Just Dance, which I tried at the Clever Girls Collective party on Saturday night. It's so entertaining, you never even notice you're exercising. Which is exactly what I need until someone invents a machine that exercises you while you sleep. Could one of you please get going on that? * It's OK to say "Er, nothing." * That is my answer. Unless you count my mad dash for the train home today and the 10 minutes I spent doing Just Dance last Saturday night. I am quite sure it effectively wiped out the chocolate-dipped churros I'd consumed for lunch. * I know I need to exercise more, Mom. * Churros are really, really, really good. Boy that Just Dance was a workout wasn't it? I had a blast hanging out with you this weekend! Don't be a stranger! I love that you post pictures of women who are not stick skinny and recognize that they are beautiful - I wish I could recognize that I am beautiful despite my body shape. This does help, it doesn't mean I really get it, but it helps. Thank you! Jazzercise!!! When their slogan says "we fit every body" they really mean it, and I love it, and I've just come back after a seven year absence and it is helping fix my health issues, I've lost a bra size, and when I do it, I am dancing! I recommend it to anybody and everybody, especially those of us who have extra stress in our home lives. Frist class is always free! My secret dream is to lose 65 pounds and become an instructor. Shhh, don't tell. The best churros in the whole world are found in Ensenada, where some vendors make a straight churro then inject it with dulce de leche. It's almost good enough to make me leave my kids for a trip to get one, but not quite yet. I LOVE Just Dance! I used to play part 1 every single day! I can't say I lost any weight when I was doing that but that could be because I was counteracting the affects with daily cupcakes for dinner. 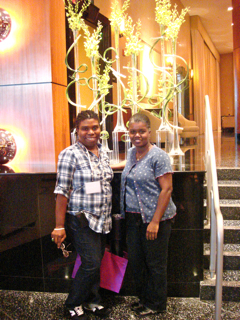 Great meeting you at Blogalicious! I'm so happy I was able to go at the last minute. Love the pictures! It was so great meeting you. Thanks for sending the link! OMG! Dr. Ellis was one of my college professors! How random to see her here. It was a really good class too--August Wilson Dramas. 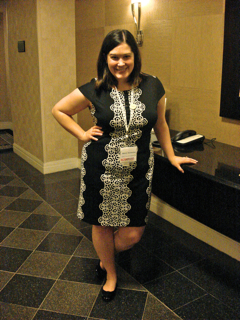 I didn't know any of those women -- need to get to some different conferences! I am becoming a hot yoga addict. You really should try it... but don't say I didn't warn you. Hollee, anything involving heat + yoga is my idea of torture!!! I like to jump around like a crazy woman. Kim, yeah, Just Dance WAS a workout, but a stealth one! And Ginger, I did Jazzercise in high school and loved it, but what I most love about trying Just Dance is that I can do it at home. 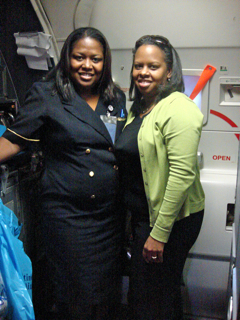 I love your dream of becoming an instructor! Ellen: Dr. Ellis is an amazing person. She has a show now, check her website! Churros: I had them in Madrid once, at a place that only opened at midnight. Insanely good. I've heard about Just Dance and have been thinking about trying it out, too. I love the Just Dance. It is super fun. it's nice to put faces with the blogs too! Sounds like you had a blast! I, too love churros! They rock! The conference sounds like a lot of fun. I love these comments and the post! You were getting some real heat in the comments as of late! Oh, just you wait, I'm sure someone will find churros offensive. 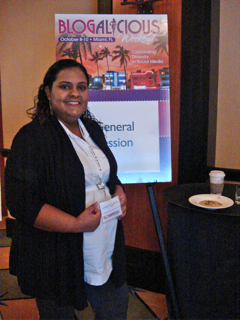 :) And, yes, the conference was a blast—and really inspiring. This was such a great idea! Thanks for asking us to be part of it. 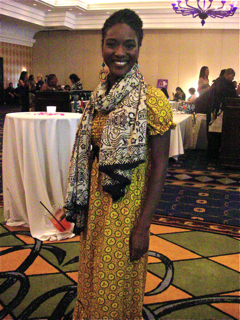 Thank you for writing this post and sharing my picture :) You share a diversity of women from #Blogalicious10. Sidenote: I "might" have that Just Dance performance...LOL. I have to look at my records.